Pork tenderloin is nicely seasoned and cooked with a wonderful creamy mustard sauce in this easy recipe. The pork tenderloin is sliced about 3/4 inch thick but can be pressed or gently pounded to make the medallions thinner for quicker cooking. Trim the pork of excess fat and remove the silver skin. Cut into 3/4-inch slices and set aside. In a large skillet, melt 2 tablespoons of butter over medium heat. Add the shallot and mushrooms and cook, stirring, until mushrooms are tender. Remove the mushrooms to a plate and set aside. Add the remaining tablespoon of butter to the skillet along with the olive oil. Cook the pork medallions for about 10 minutes, turning to brown both sides, or until cooked through. Sprinkle with salt and pepper and remove to a warm plate; keep warm. Add wine or apple juice to the skillet. Stir in the cream and mustard; bring to a boil. Boil, stirring, for about 2 minutes. Add the mushrooms to the cream mixture and cook for 1 minute longer. 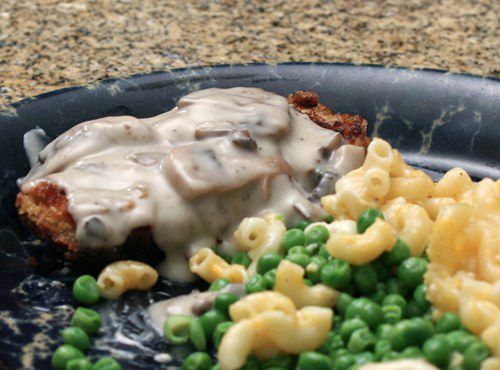 Arrange pork medallions on a serving platter and spoon mushroom sauce over all. Sprinkle with chopped parsley, if desired. Serve with noodles, rice, or potatoes along with a tossed salad or steamed vegetables.